After Jeepin’ with other folks in the Arizona desert, we decided to buy our own Jeep — a 1993 Wrangler. We purchased it from one of the folks who we had gone Jeepin’ with. He decided he likes his Harley better. Anyway, for an older Jeep, it’s pretty tricked out — it has a hard top, an electric winch, large jack, great stereo, and a CB. The CB has a “PA” (Public Address) mode which allows you to talk through a speaker that’s located in the engine compartment. The PA turns the Jeep into a police car. It’ll be handy to talk to drivers in front of me or to neighbors — “Come out with your hands up”. More Jeep photos . . .
Wow.. how cool is that!!?? It looks like new .. very Nice. that looks like so much fun! Maddy will be jealous – she always says she wants a jeep! Where will the Jeep live? Behind the CRV? 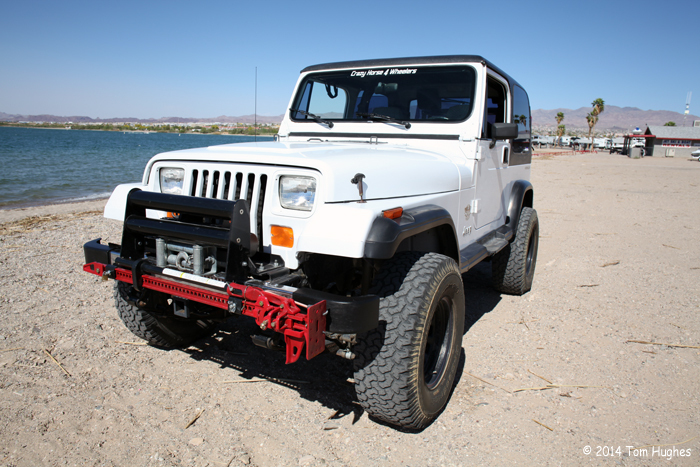 Jeep will stay in Lake Havasu City — in storage unit October.